Igor Fokin was born in Leningrad, now St. Petersburg. His parents were divorced, and he lived with his mother, grandmother and younger sister. Igor was very attached to his father and the divorce left him with an irreparable sense of loss. When he was still a little boy, Igor took care of his younger sister because his mother and grandmother worked. Even then, he displayed a love and talent for music. He also loved to draw and would always sketch in his school notebooks and diaries. At 13, Igor was enrolled at the School of the Arts in the theatre set design department. Soon his work was being shown at municipal exhibitions. One of his most successful creations was a costume for a character called fairy Berylune from Maeterlinck’s The Blue Bird. Later, while studying at the Serov College of the Arts, he made his first puppet, also Berylune. While working toward their diplomas, Igor and his friends decided to found their own theatre. After graduating from college, he was immediately drafted into the army. When he returned, they opened the theatre in the town of Pushkin, not far from Leningrad. The theatre was located in the old church and became known as The Wooden Horse. At the same time, Igor enrolled at the Leningrad Academy of Culture to study theatre directing. His most successful play was Fenist the Bright Falcon based on the Russian fairytale and written by one of his colleagues, Vadim Kinovich. Pushkin residents helped put the performance together. Igor even called this work “a united creation.” All the puppets in this beautiful, colorful production are now in the Children’s Museum in St. Petersburg. When the hard times of Perestroika set in, Igor had to do all kinds of work to survive. His wife, Asya, encouraged him to continue making puppets. 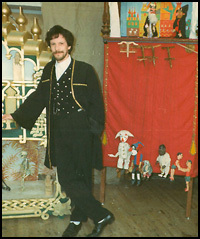 Their creative “union” helped keep his dream of a puppet theatre alive. In 1994, Igor, Asya and their 7-year-old son, Yevgeny moved to America. Soon after, his daughter, Anna, was born. For two years, Igor performed in Cambridge and became a main attraction on Harvard Square. The Russian puppeteer’s shows drew people from around the country. Audiences would come filled with curiosity, eager to see him and his marionettes. Igor’s performances were mostly improvisatory. He also continued making puppets. In 1996, his son Grisha was born. Two weeks later, Igor died of a heart attack after coming home from a performance on the Square. He was only 36. The family had no alternative but to return to St. Petersburg. View some of Igor's drawings, sketches and notes created throughout his career. There are other websites that pay tribute to Igor. One was www.igorfokin.com, created by Jim Show, a fellow Harvard Square performer.